My friends daughter is getting married on July 7, 2007. She knows that I always make those cute little flower pens for my craft shows. 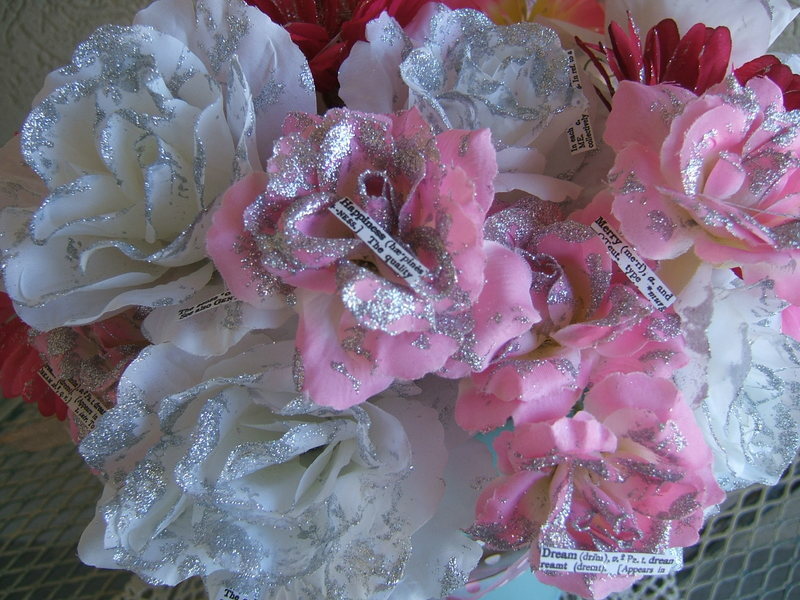 Anyway, she asked if I could make a few for the table decorations and of course I said yes!! I don't know why I love to make these flowers!! 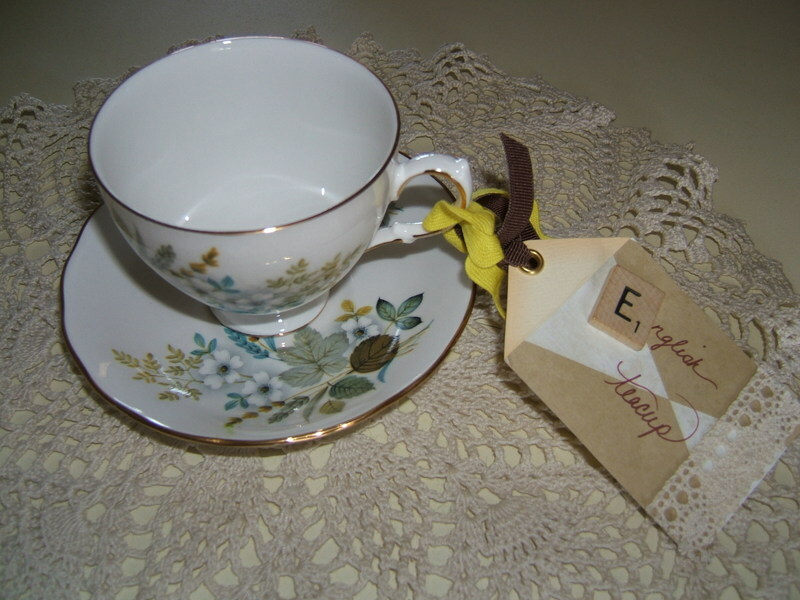 Since it is for a wedding....I couldn't have the green stem showing with floral tape....so I covered it with shabby chic fabric, glittered the flowers and added a few sentiments here and there. I saw the sayings or stampings in a magazine...and had to try it! Hope she likes them!! Tonight is my last night at work for 9 days! Then my vacation will start-----we plan on just relaxing and playing!! I will also be working on my mom's 81'st birthday bash on 7/7/07!! 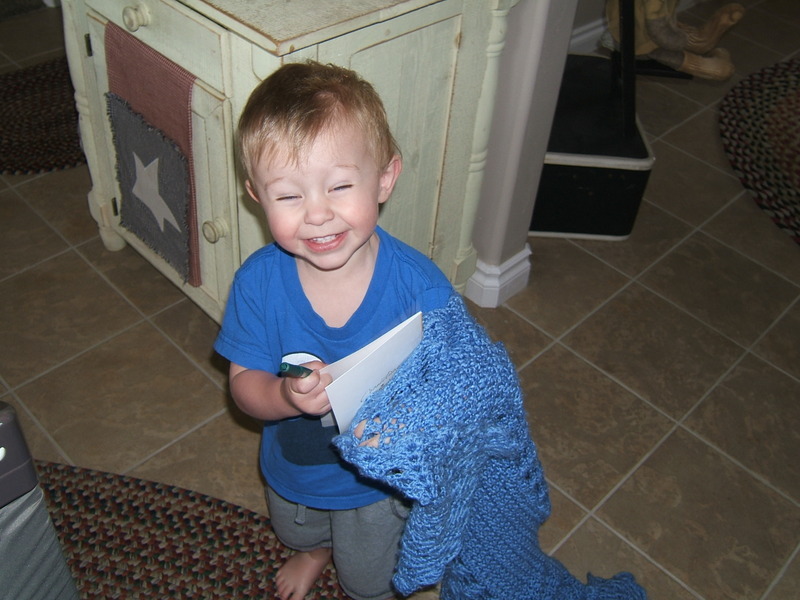 Lots of fun things on that day!! 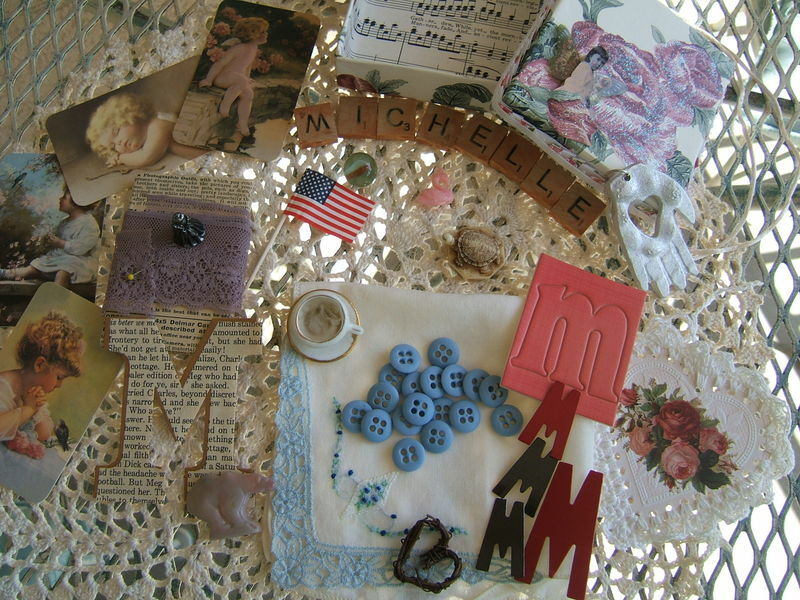 Just wanted to share the beautiful treasures that I received from Cheryl of Artsy Fartsy. 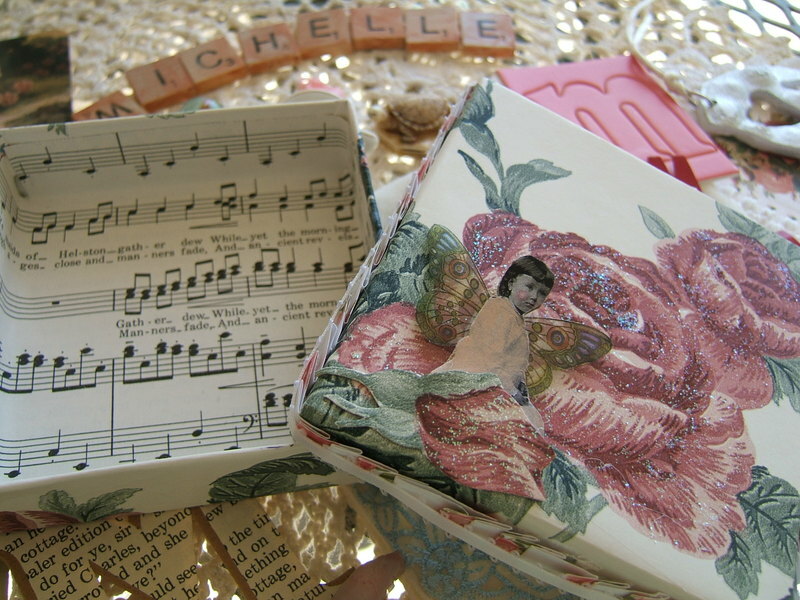 She used a small gift box, covered it with paper, ribbon, sparkles and a darling little fairy girl. 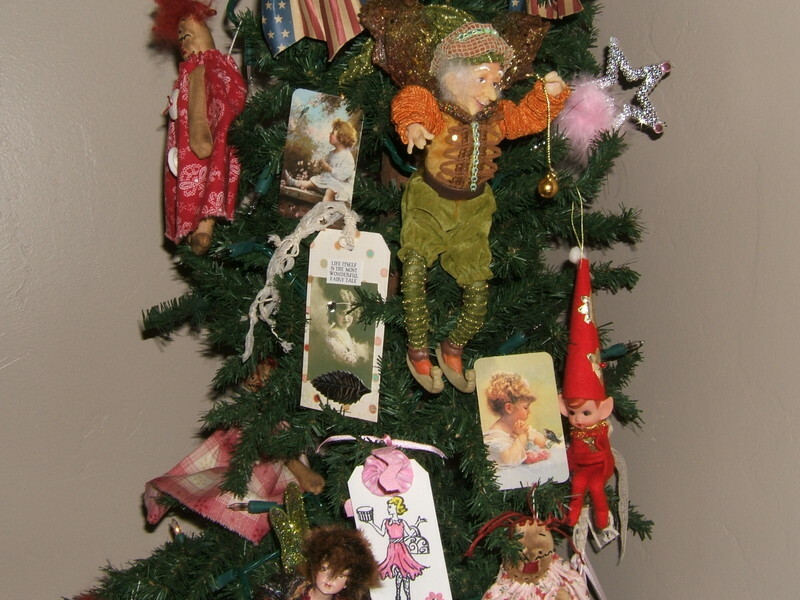 I got so excited with my goodies this week, I started decorating my all seasons Christmas tree.....I am excited to start getting items ready for Christmas in July!! 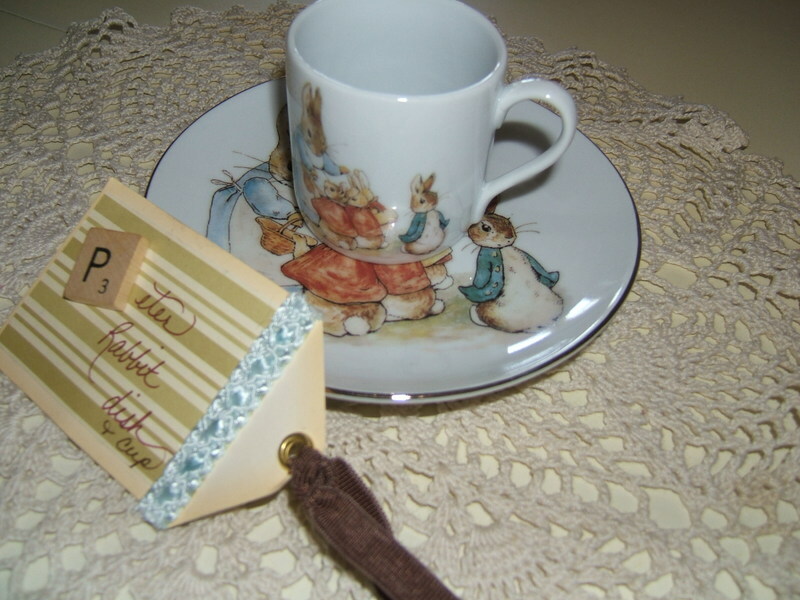 I am still smiling over the Peter Rabbit dish and cup from Ele......I had the perfect bunny to display with it.....so cute and full of Whimsy!!! 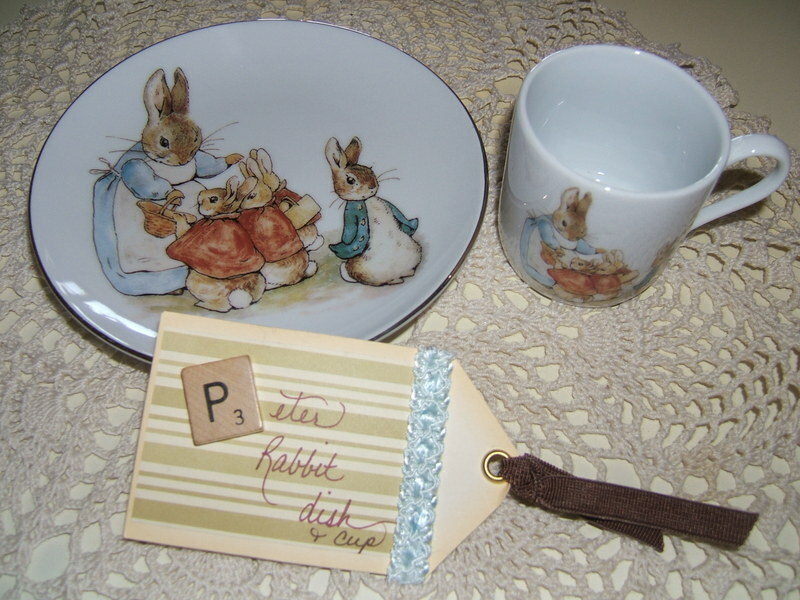 P is for Peter Rabbit dish and cup, so little Jake can join in the tea party. 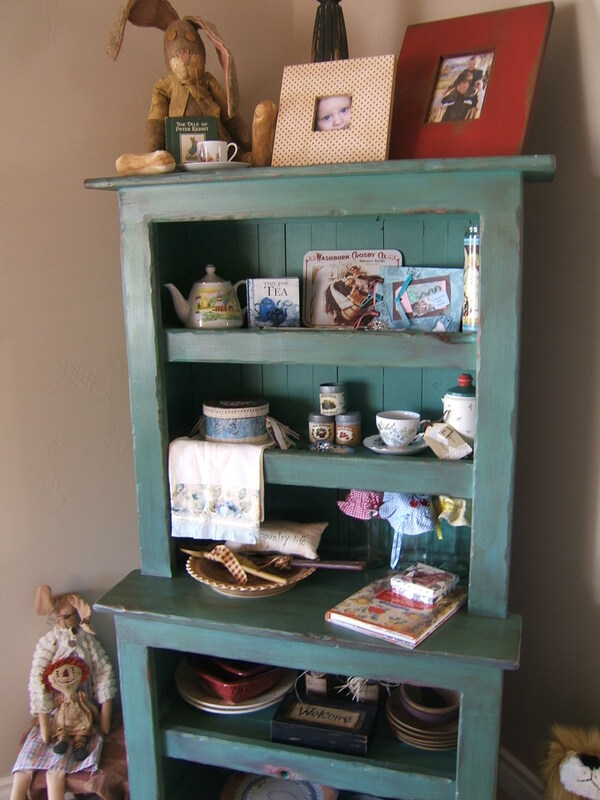 A very beautiful vintage piece. How did Ele know that I adore Peter Rabbit? 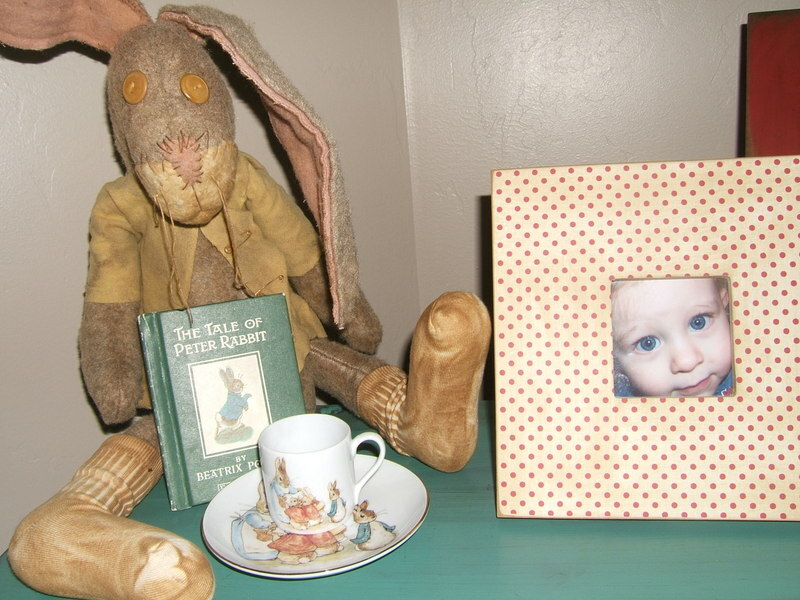 I have made several Peter Rabbit dolls and have always wanted to collect "Peter Rabbit" items. 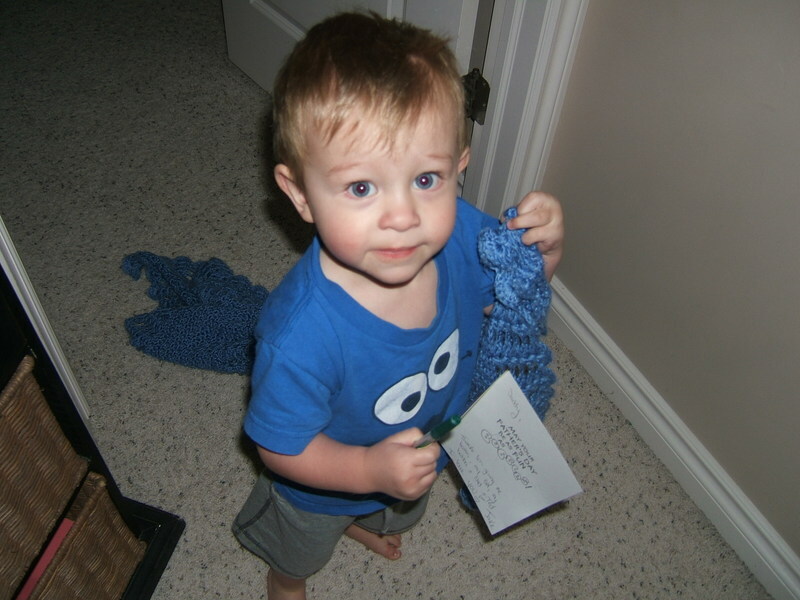 Yes, this is one of the items that gave me goosebumps and got me all mushy!! R is for, Rose Tea Towel. Isn't this a beauty!!! I dearly love it Ele!! 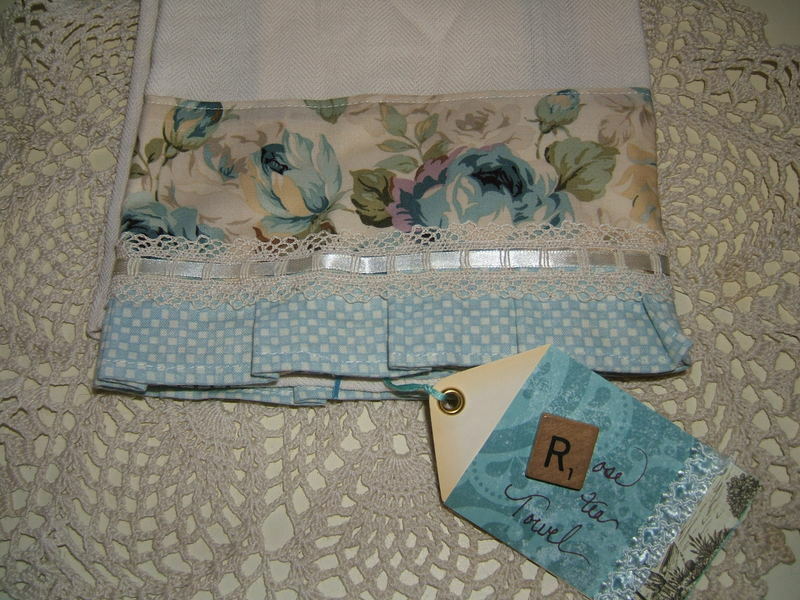 She made this tea towel ---beautiful blue roses, ruffles, lace and one of those darling scrabble tags!! Love, love love it!!! 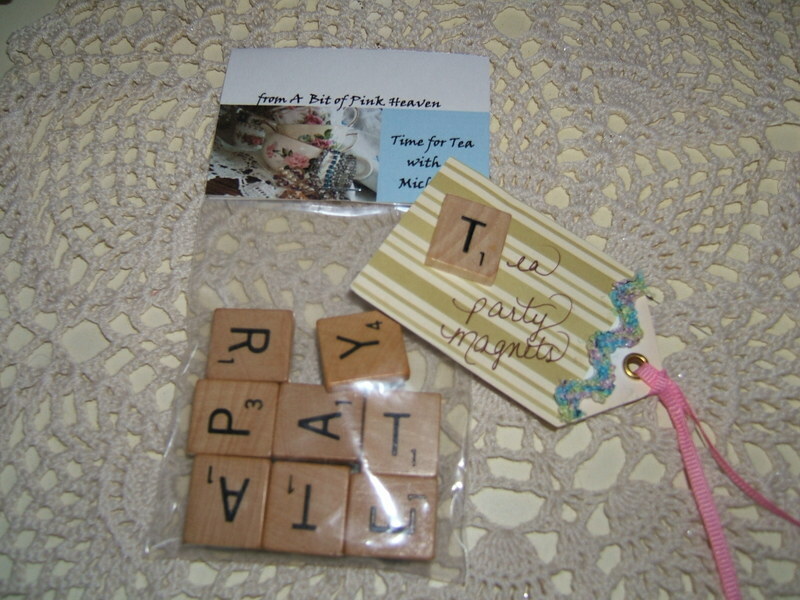 T is for, Tea Party Scrabble Magnets. 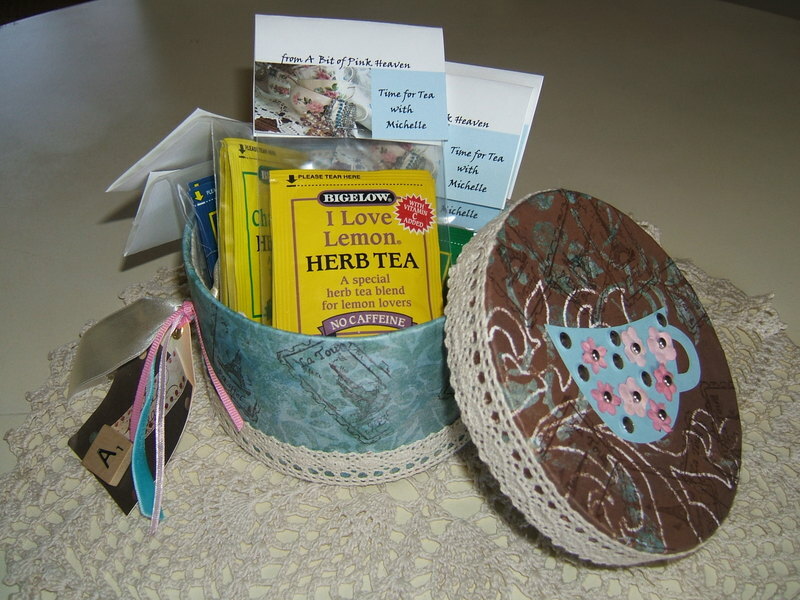 What a cute idea!! I can't wait to put these in my dining room! I actually have a magnetic memo board that these will look so wonderful on. So clever!! 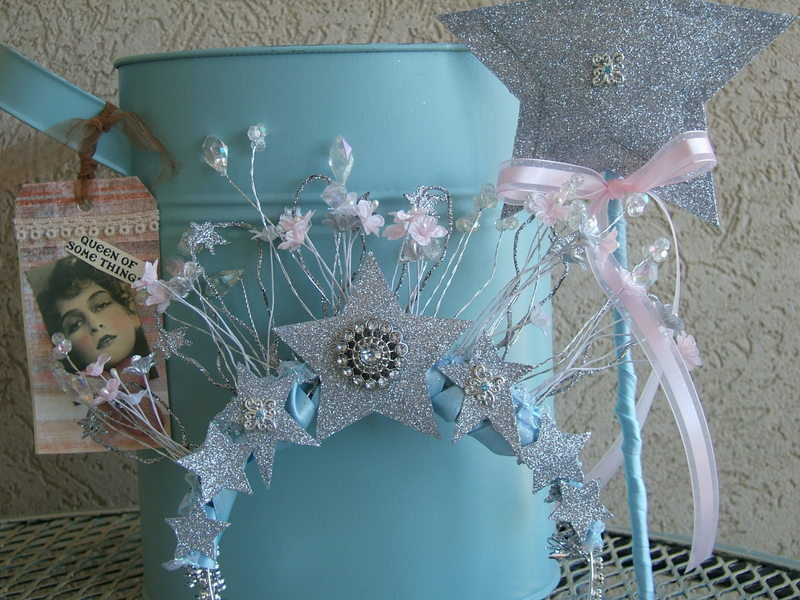 Today I mailed Lonnie's tiara......hope she loves it! 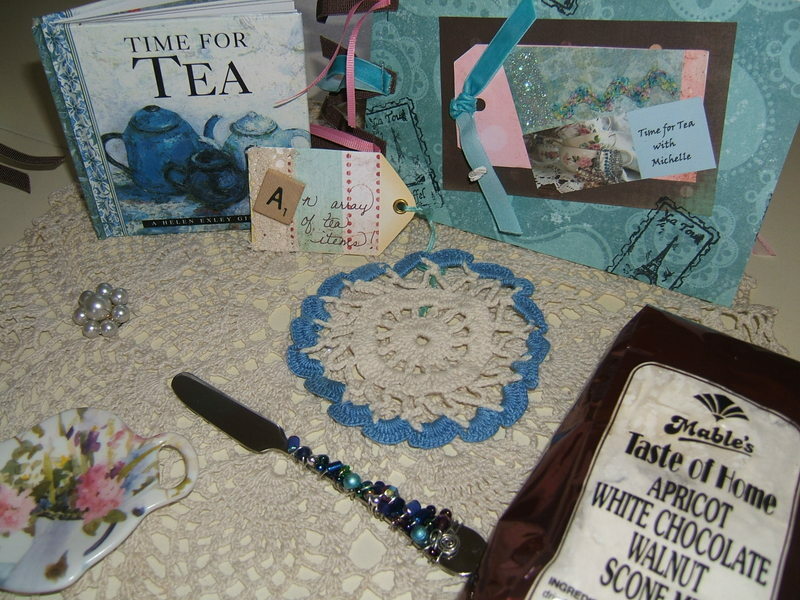 I want to thank Holly of HollyDoodleDesigns for hosting this wonderful swap. 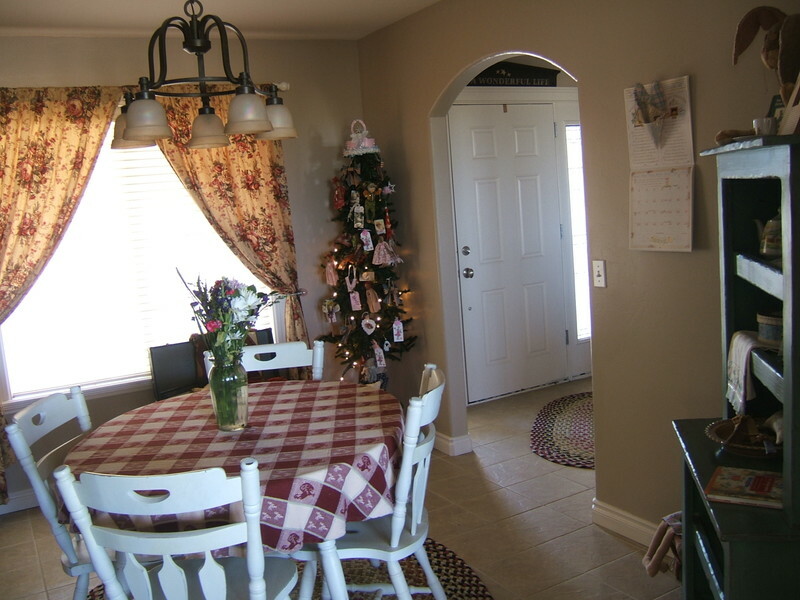 I used rusty star garland and sprinkled the crap out of it with glitter. 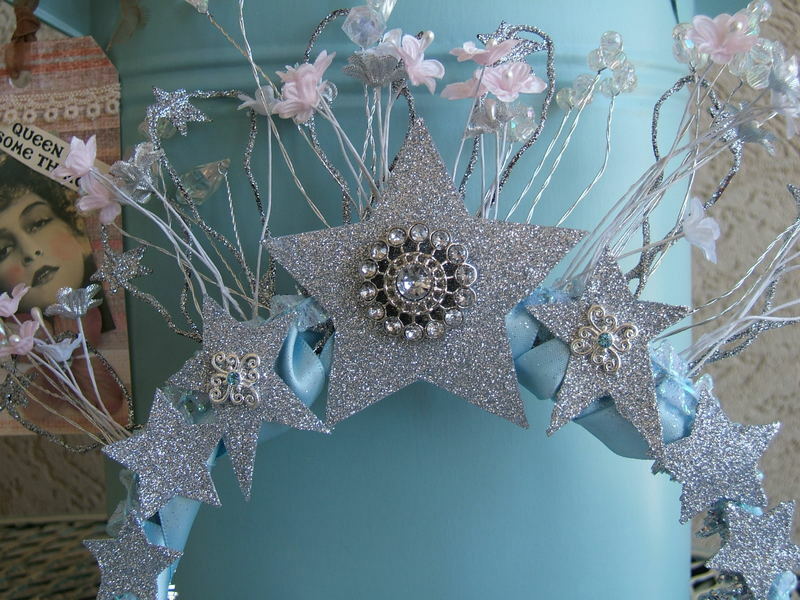 I made glittery star cut outs, put some bling and more bling......added flowers, ribbon, tinsel, lace and garland. 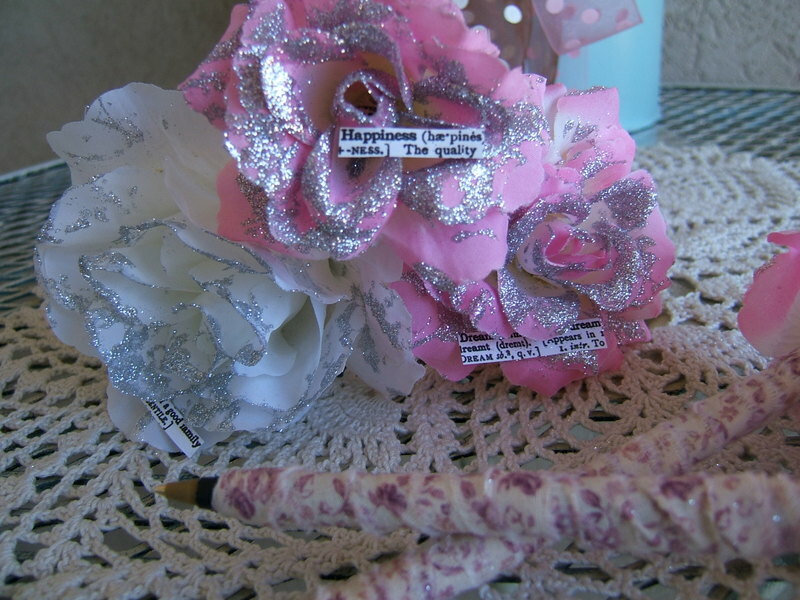 I even made her a magical fairy princess wand just for fun......we were on the same page with that one. I'm sad to see this swap end............had a great time :) Check out all of the tiara's that these lovely gals made---they are devine!! 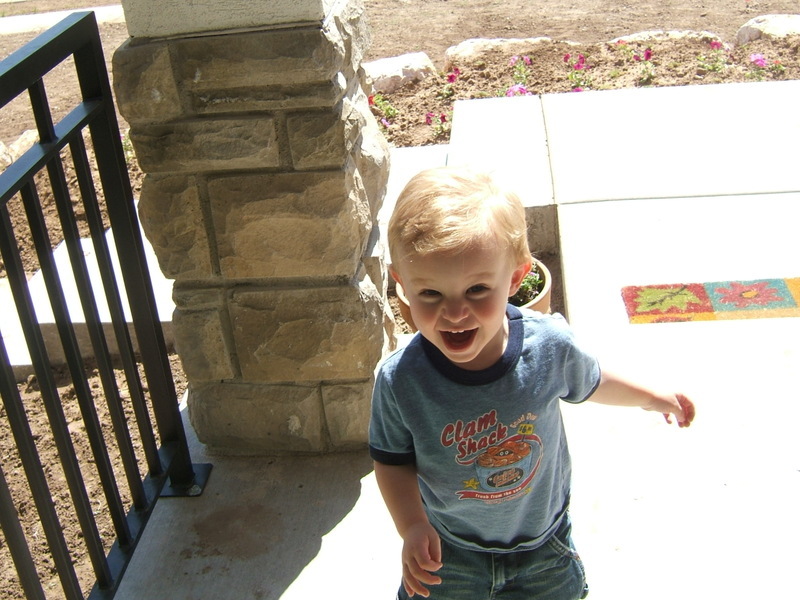 Jake wanted me to wish you a Happy Father's Day! 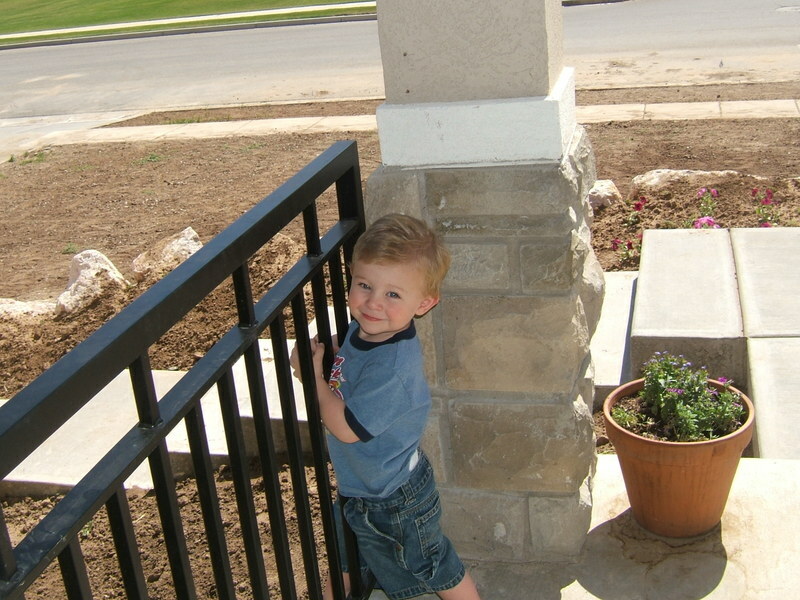 Thanks for being the best dad our little boy could ever have.......I love our little family. 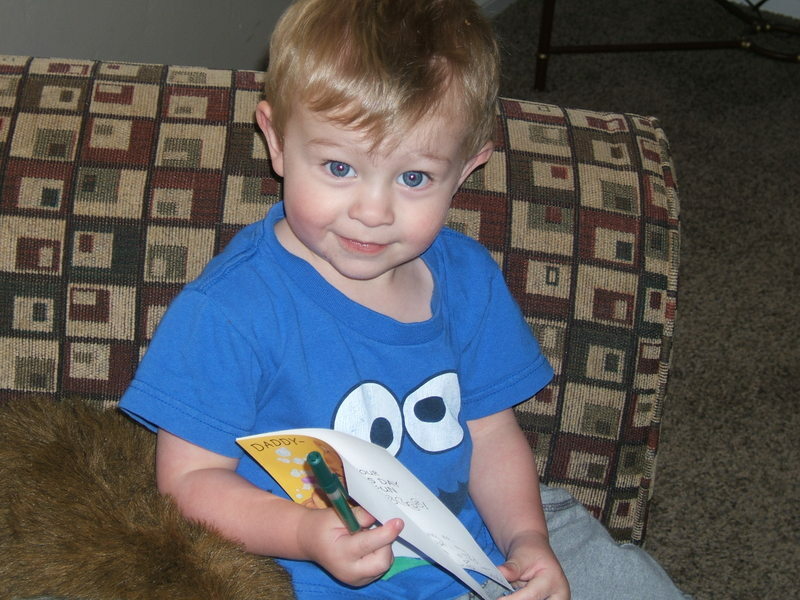 Here is a picture of Jake signing your Father's Day card.......Happy Day!